The Scottish play, an ancient curse, and a disembodied head on a dessert trolley out for revenge is the story of actors Tim and Rupert who activate an ancient curse and awaken Macbeth’s severed head, who’s athirst for revenge on William Shakespeare for ruining his life. 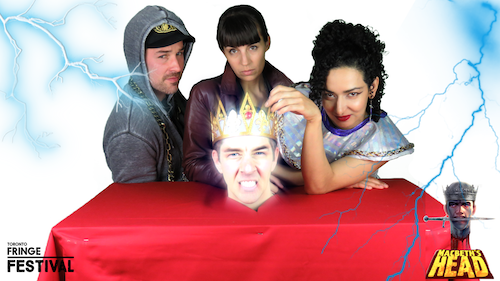 The Head, using his arcane powers, enslaves Tim and Rupert, and then brings Space Pirate Cleopatra, gender bending Richard III, and Hip Hop Hamlet to life to help in his insidious designs. It’s up to Tim and Rupert to stop the maniacal Head lest Shakespeare’s works are obliterated from the face of the earth forever! This view of classical material is part of Malfi Productions’ mandate: to produce entertaining and interesting film, television, theatre, and literature by merging tradition with innovation for an audience who craves emotional and intellectual risk. Multi-disciplinary artist Kyle McDonald is directing and taking on the title role of The Head and is joined by Scott McCulloch as William Shakespeare (winner of Canada International Film Festival) and Adrienne Kress as the iniquitous Richard III (author of award winning and internationally published children’s novels Alex and the Ironic Gentleman and Timothy and the Dragon’s Gate), Gabriel DiFabio as Hamlet, Roselyn Kelada-Sedra as Cleopatra, Roberto Esteves as Tim, and Julian Nicholson as Rupert. This venue is wheelchair-accessible through a secondary route.